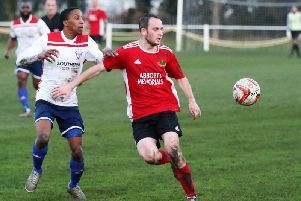 Knaresborough Town suffered a third successive NCEL Premier Division defeat, losing out to the only goal of the game at Handsworth Parramore. Having being edged out by fellow high-flyers Penistone Church and Yorkshire Amateur in their previous two outings, Paul Stansfield's men knew they were in for another tough afternoon when they travelled to Sheffield to tackle a side expected by many to challenge for the title this term. They did however begin slowly and, in reality, rarely reached their normal level of determination in what was a disappointing first-half showing. Parramore's Jake Currie shot wide early on, then, in the 11th minute, squeezed home a strike from a narrow after the ball was moved inside from the right flank. The hosts continued to make most of the running and Waide Fairhurst and Oliver Fearon both fired over before Boro stopper Jack Rushworth saved well from a low Jamie Green effort. Eventually, Town did manage to string a few passes together but the closest they came was when Nick Black’s overhead kick put Brad Walker’s centre wide of the target late in the half. There was still time for Rushworth to tip Danny Buttle’s effort wide of the post at the other end and for Will Lenehan to try his luck with a hopeful strike from 40 yards, however this was easily dealt with by Jan Budtz in the home goal. Rushworth was again in action soon after the break as he kept out Green’s free-kick, but as the game progressed, Boro began to play the better football. Ben Cohen saw a long-range strike saved, Rob Youhill was wide and Budtz saved Walker’s snap-shot at the near post after Youhill’s cross from the right. Fairhurst then ran clear for Handsworth as the hosts hit back, but he fired wide of the mark from a narrow angle. Boro almost had an equaliser when Dan Thirkell managed to get his head to Rob Worrall’s free-kick, only to see Budtz tip against the crossbar, even though the referee failed to recognise this as a corner. 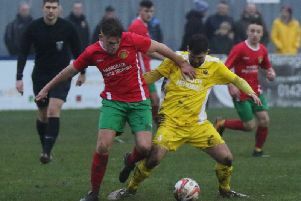 A late Steve Bromley header was also dealt with by Budtz, however Handsworth were able to hold out with Knaresborough's overall showing lacking the precision and determination of many matches earlier in the season. Defeat sees the Manse Lane outfit drop two places to fifth in the table.